What Else Can I Expect from an Online Bachelor's in Sports Management Program? Accreditation for Online Bachelor's in Sports Management Degrees? Sports is a massive industry, with an estimated revenue between $440 and $470 billion per year. There is demand for nearly every type of role in the sports industry, especially managers and business professionals. An online degree in sports management prepares graduates for a wide variety of career paths in academia, retail, and community and professional sports. With a degree in sports management, you can go from a high school athlete to a qualified employee who understands the sports industry from the ground up. 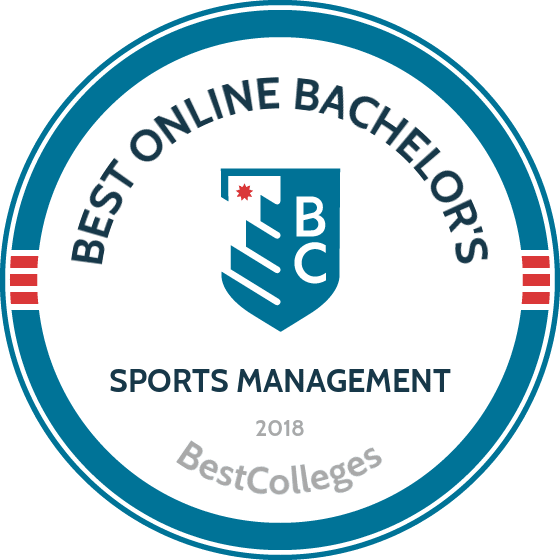 Most online bachelor's in sports management programs include core classes that cover the fundamentals needed to start a career in the industry, such as principles of management, accounting, economics, and physical science. Beyond these common core classes, sports management curriculums vary greatly depending on the specialization of each program. As such, students should select a program that includes a specialization or concentration that will prepare them for their desired career path. For example, a student who aspires to work at a major sports network might consider a sports media specialization. Sports media programs explore the ways that television, radio, and the internet are used as promotional tools. You can also study sports events and facility management, which focuses on planning and hosting sporting events, or sports accounting and finance, which provides students with in-depth knowledge of the business side of professional sports organizations. One thing to keep in mind when choose a program is location. Attending a program that is located near a major sports organization could help you when it's time to find an internship or a job. The University of Florida, located in Gainesville, is one of the top public universities in the state. Through UF Online, students can pursue one of 19 different majors across several of UF's colleges. UF Online is the perfect choice for Florida residents in search of an affordable online education, as online tuition for in-state students is only 75% of residential tuition. UF's online sports management degree covers a wide range of sports business topics including marketing, business finance, and facility design. All coursework can be completed online, but the degree also requires experiential learning through an in-person internship during the final semester after all online coursework is completed. The internship is a full-time experience in the field (40 hours per week) providing graduating students with the advantage of having work experience and networking opportunities as they enter their careers. Transfer students can bring up to 60 credits from another institution if they have a GPA of at least 2.0 and have completed four required courses with at least a 2.2 GPA. Southern New Hampshire University offers an affordable online education to over 75,000 adult and non-traditional learners. For the past 25 years, SNHU has awarded an online bachelor's degree in sports management. This online degree offers students a well-rounded foundation in sports management through a combination of liberal arts requirements and a business-focused curriculum. Students must also complete two internships, or one internship and a practicum in sports management, to satisfy the experiential learning requirement. The program has prepared students for careers with professional sports teams, local and regional recreational organizations like the YMCA and Boys & Girls Club, and even the United States Olympic Committee. Courses are just eight weeks long and are offered six times throughout the year, giving students the opportunity to accelerate their online education. SNHU's transfer-friendly policies allow students to transfer up to 90 credits. SNHU has been a Military Friendly School since 2009 and offers a 30% tuition discount to active-duty service members and their spouses. Troy University, a public university founded in 1887, has been a leader in online and distance education for the past 20 years. Students interested in pursuing a flexible sport management degree online may be interested in Troy’s bachelor's of science in hospitality, sport, and tourism management. Troy University is accredited by the Southern Association of Colleges and Schools Commission on Colleges (SACS) and the sport management program is accredited by the Commission on Sport Management Accreditation. Students in the program receive an exceptional education, engage in service learning opportunities, and are required to complete an internship. Experiential learning experiences are the cornerstone to Troy University’s sport management degree. TROY’s faculty are readily available to answer questions regarding classes and to provide career mentorship. Graduates of TROY’s sport management program have obtained employment in professional sports (both major and minor league teams), Division I intercollegiate athletics, campus recreation, and parks and recreation departments. Preparing students for career and life success is the #1 priority of the School of Hospitality, Sport and Tourism Management. Located in Danville, VA, Averett University is dedicated to serving working adults through its Graduate and Professional Studies division. Averett's online sports management degree is offered through the school's Individually Designed for Adult Learners Program (IDEAL). IDEAL students are paired with an advisor who helps them evaluate past experiences for transfer credit, define their academic goals, and choose the right courses. This program allows online students to design their BS in physical education: sports management degree around their interests through independent study and relevant field experiences. Graduates are prepared to pursue management positions in amateur, collegiate, or professional sports, sporting good sales, facility management, and more. Averett's accelerated course schedule allows online students to earn a degree in as few as two years. The school also strives to provide an affordable online education to its students, and Averett's online courses are, on average, 80% cheaper than an equivalent at a private college in Virginia. Founded in 1966, Bellevue University is a private university in Bellevue, Nebraska. The school's core values revolve around free market capitalism and preserving America's democratic way of life. As such, all undergraduate students must complete a series of courses, called the Kirkpatrick Signature Series, that encourages students to examine their roles as citizens. Bellevue's online sports management degree covers core sports business topics like finance, marketing, public relations, and law. Students must complete 36 major credits, all of which can be completed online, as well as a three-credit internship. Bellevue encourages students pursuing the online bachelor's degree in sports management to complement the degree with a minor in business administration. Bellevue helps online students accelerate their educations with a generous transfer policy, though transfer students must complete at least 30 credit hours through the school. Students can also choose an accelerated cohort format online, which can be completed in 72 weeks. University of Minnesota Crookston offers students the ability to earn a UM degree while also balancing work and family commitments. UMC's online programs have an emphasis on real-world experience, and urge students to complement their online degrees with internships and online research opportunities. UMC offers an online BS in sport and recreation management that prepares students for careers in professional, collegiate, and community sport organizations. The curriculum includes 62 credits of major requirements in areas like sport finance and economics, psychology of sport, human resource management, and business writing. The program encourages students to gain real-world experience through study abroad opportunities, job shadowing, networking, and a required internship. The school also suggests that students pair their sports management online degree with a minor in coaching, though it is only offered on-campus. Coursework is available 24/7 online, and the asynchronous course schedule allows students to complete assignments at their leisure. Located in the foothills of Georgia's Appalachian Mountains, Toccoa Falls College is a Christ-centered university and is affiliated with the Christian and Missionary Alliance. The school is committed to making higher education affordable for its students, boasting that 100% of TFC students receive some form of financial aid from the school. TFC offers an online BS in sport management degree that teaches students about sport and business best practices from a biblical perspective. Students can choose from six minors, including: management, marketing, nonprofit business administration, organizational leadership, physical education coaching, and sports management. This online sports management degree covers topics like sport law & ethics, sport marketing, and injury care and prevention. Upon graduation, students are presented with a National Coaching Certificate in addition to their degree. TFC boasts that 100% of graduates from the sport management program are employed in the field within six months. Midway University, located in Midway, KY, is a liberal arts institution that offers its 1,600 students several career-focused degree programs. MU is dedicated to making higher education accessible for all students with its robust distance learning programs, including an online sports management degree. Aside from a required internship, the program can be completed entirely online. The program prepares students to work in sports-related businesses and institutions in the public or private sphere. The core curriculum includes courses in sport psychology, marketing, legal issues in sport, and more. Midway is not authorized to provide online courses in all states, and interested students who live outside of Kentucky should check the school's State Authorization list before applying. The school's online programs are offered in an accelerated eight-week format, with five start times throughout the year. MU also has a simplified admissions process for online students. Founded in 1828, McKendree University was Illinois' first institution of higher learning. Today, the school offers nine online undergraduate and graduate degrees through McKendree Online. Students interested in pursuing an online sports management degree should consider MU's bachelor of business administration in sports management. This online program prepares students for careers in sports-related businesses, fitness and community centers, and sport facilities. Students must complete 120 credit hours to earn the degree, with at least 40 coming from courses at the 300 or 400 level. There is also a required internship where students gain valuable hands-on experience. Online courses start every eight weeks, giving motivated students the opportunity to quickly earn their online degrees, and many students choose to take two courses during every eight-week session. Transfer students are welcome to apply, though at least 30 of the required 120 credit hours must be completed at McKendree. Columbia College offers over 29 degrees to nearly 16,000 students through its Online Campus. Students can major in sports management while earning either a bachelor's of arts or a bachelor's of science in business administration through Columbia College Online. The major requires students to complete 120 credit hours of general and business-related courses to graduate. Both degrees share a 51-credit core curriculum that covers topics like business communication, business law, international business, and strategic management. Each program also includes major requirements that Students can transfer 27 to 48 credits from other institutions, depending on whether they're pursuing a BA or BS. Columbia offers six online sessions a year, two during each semester, to help students quickly earn their online sports management degree. Columbia College is a Yellow Ribbon Program participant, and active military personnel and veterans can take advantage of a variety of scholarships and discounts. Located in Grand Rapids, MI, Davenport University serves 9,000 students at its Grand Rapids, MI, campus as well as through its virtual platform DU Online. Many of the online courses available through DU Online are taught asynchronously, allowing students to learn at their own pace. For students looking for more camaraderie and structure in their online educations, DU also offers Real Time Online courses that meet online at scheduled times. Davenport offers an online bachelor's in business administration in sports management that emphasizes experiential learning. All coursework can be completed online, except for an in-person internship that provides students 300 hours of real sports management experience. Many students complete their internships at one of the several minor league teams in the Davenport area, and some have secured internships with professional sports teams in Detroit. Davenport's program is also one of only two sports management programs in Michigan to be accredited by the Commission on Sport Management Accreditation. Wilmington University was founded in 1968 in New Castle, DE. Today, the school is committed to making higher education accessible to all learners through its several online degree programs. The online sports management degree at WU provides students with foundational knowledge and practical experiences that prepare them for success in sports management. Faculty bring first-hand experience to the classroom, as many are employed as general managers, sports attorneys, sports agents, and NCAA leaders. The curriculum includes courses in business management, ethics, and the sociology of sport, and also includes a hands-on internship. Students can supplement their online bachelor's degree in sports management with a concentration in nonprofit management. This program prepares students to pursue a variety of careers in professional sports, collegiate sports, business, or nonprofit organizations. WU also offers a generous transfer policy that allows students to transfer up to 90 credits from other institutions. Concordia University Chicago is Christian liberal arts college in the the Lutheran tradition. Concordia offers an accelerated degree program with courses that last just five weeks that is perfect for working professionals. Students in these accelerated programs can earn their bachelor's degree online in just 16 months. The accelerated 128-credit online sports management degree prepares students for careers in athletics administration, business operations, game operations, and more. The curriculum covers several foundational topics, including marketing, management, sports equipment manufacturing, event operations, and ticket sales. Concordia allows transfer students to bring up to 67 credits from another college or university. Many students can also receive credit from prior experiences, such as work or military experience, seminars, or training programs. Applicants must have completed at least 30 credits at another college or university with a minimum GPA of 2.0 to be considered. Located in Hobbs, NM, University of the Southwest is a private Christian university founded in 1962. Through USWOnline, students can pursue a number of undergraduate and graduate degrees online, including a bachelor's in business administration with an emphasis in sports management. This sports management degree online explores sports and business concepts from both a domestic and international perspective. Courses can be completed entirely online, on-campus at the school's New Mexico campus, or a combination of both. In addition to earning a degree, the program prepares students to apply for certification with the National American Society of Sport Management and with the National Association for Sport and Physical Education. Online courses at USW are offered asynchronously, allowing students to complete coursework at their own pace. USW supports its online students through advisor mentoring, online tutoring, and tech help. Culver Stockton College is a private liberal arts college founded in 1863 that overlooks the Mississippi River in Canton, MO. CSC offers a unique 12/3 semester schedule, which includes 12-week-long semesters followed by a three-week break during which students can pursue an internship, travel study opportunity, or a single class. Students can complete the school's BS in sports management entirely online, with the exception of an on-campus internship or off-campus practical experience. Those who earn their sports management degree online from CSC can choose to specialize in the following areas: accounting & finance, marketing, and business administration. The program prepares students for careers in athletic directing, sports information, sport marketing, or recreational sports management. CSC's online courses take five to eight weeks to complete. Students may cross-register in both on-campus and online courses if they have a GPA of at least 2.0 and receive signed approval. All online bachelor's in sports management programs have their own specialities. Specialized concentrations, unique internship offerings, and professional development opportunities can play a huge role in helping a student pursue their dream job. If you know what type of career you would like to have, then make sure that you find a school that gives you the best education to prepare you for success. Sport Marketing: In this course students learn about the marketing techniques used in current sports advertising campaigns. This course can be the first step towards a career in a sports organization's marketing team or as a sports marketing manager. Finance and Economics of Sports: This course teaches students the ins and outs of the financial and economic tools that are used in the sports industry today. Students who enjoy this foundational course may wish to pursue careers as the controller of a sports organization or as a chief financial officer. Management of Sports Organizations: This course prepares students for managerial roles within sports organizations by teaching common management concepts. Students who enjoy this course may have the necessary skills to become the manager of a sports team. HOW LONG DOES IT TAKE TO GET AN ONLINE BACHELOR'S IN SPORTS MANAGEMENT? To earn a sports management degree online, most programs require the completion of 120 credits over four years of full-time study. However, there are some factors that could lengthen how long it takes to earn your degree. For example, certain programs have an additional internship or a capstone requirement. Another factor that can impact the length of a program is whether you choose to study with a cohort of over students or at your own pace. Programs that include a cohort tend to follow a fixed sequence, while a self-paced program can allow motivated students to earn their degree in less time if they enroll in more classes at once or study during the summer term. When choosing a school for your sports management degree, be sure to select one that has been properly accredited. Attending an accredited school is important to future employers because it tells them that you have received a standard level of education as approved by the U.S. Department of Education (DOE) and the Council for Higher Education Accreditation (CHEA). Both the DOE and CHEA are agencies that establish and implement educational policies and standards so that all schools meet the same criteria for excellence. These agencies hold educational institutions accountable and advocate for quality education, ensuring that your degree is worth the time and money you've invested in it. Schools can either be regionally or nationally accredited. Programs with national accreditation are often less expensive and will accept transfer units from a wider selection of schools. However, the majority of U.S. colleges are regionally accredited, which tends to have stricter qualifying standards. Graduate programs often only recognize undergraduate degrees from regionally accredited schools, which is something to keep in mind if an advanced degree is a part of your plan. The DOE is in charge of assisting schools, creating education laws, and administering student financial aid. CHEA is one of the larger college accreditation organizations in the country. They are recognized by the DOE for their accreditation standards and the quality they demand from their accredited schools. You can search for CHEA-accredited schools on their website database. While some athletes make their way into sports management after successful careers on the field, most sports managers follow a different path, earning a degree and starting in an entry-level role. A degree in sports management shows potential employers that you have learned the business and economic side of the sports industry. This helps employers trust that you have more than just a deep appreciation for sports. A degree can also make it easier to obtain management-level roles that offer higher wages. An online bachelor's in sports management prepares students for a variety of careers. Marketing and finance roles are common, but there are also several unique positions that cannot be found outside of the sports industry. Financial Manager: Financial managers are responsible for the financial aspects of a sports organizations, including budgets, investments, and overall financial health. To become a successful financial manager, you'll need a strong understanding and love of math and accounting. The median annual wage for financial managers is $121,750 with a projected employment growth of 7% from 2014–2024. Coach: Coaches are the head of any sports team. They are responsible motivating their team and for teaching athletes how they can improve their performance. Many coaches earn their position by having played a specific sport, but earning a degree can give you an edge by proving that you're trained to work with and motivate athletes. The median annual wage is $31,460 and employment is projected to have a 6% growth from 2014 to 2024. The North American Society for Sport Management (NASSM): The purpose of NASSM is to promote professional development in the sports industry. The NASSM Student Board is responsible for organizing an annual conference that gives students the chance to network with active professionals. Sport Marketing Association (SMA): This organization aims to expand the knowledge of sports marketers by providing forums and professional development opportunities. SMA holds an annual conference that allows students to network with sports marketing professionals and learn about innovations in the field. College Sports Information Directors of America (CoSIDA): The CoSIDA consists of more than 3,000 member organizations in the realm of sports public relations, media relations, and communications. CoSIDA offers members access to professional development and continuing education resources, including an annual convention. As with any other college program, many students worry about the cost of earning their degree. Luckily, there are several sources of financial aid that can make earning an online bachelor's in sports management more affordable. The first thing you should do is fill out a FAFSA form, which will qualify you for basic federal funding opportunities. There are also scholarships and grants designed specifically for sports management students. You can find these scholarships and grants at your chosen school or through private organizations, such as the Institute of Sports Management and the Women's Sports Foundation.